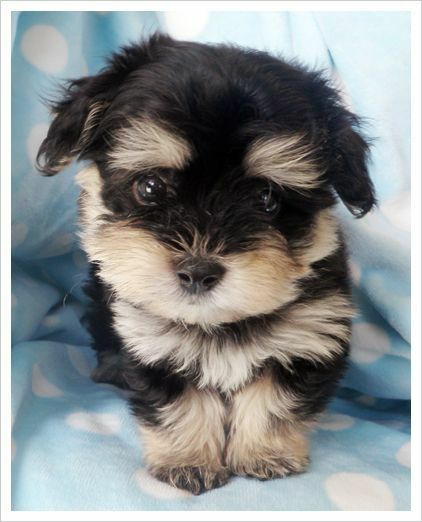 Many people love the Havanese due to how cute they look. One thing about them that really stands out and plays a big part of making them look cute is their beautiful and usually long hair. There is no question that they already look cute without any special hairstyle. Yet, there are always special occasions that you want to make them look more unique and attractive. In order to do that, changing the haircut of hairstyle of you Havanese is a really nice idea. You don’t necessarily have to actually cut their hair in some cases. For example, adding a ribbon to their hair gives them a whole new style. Now, let me show you some really nice haircut that I have collected for you. See if any of these suit your Havanese well. This is probably the most typical haircut for Havanese. Their hair can naturally grow long. In order to keep their look cute and smart, you have to make sure that their hair are groomed in a way to that they are not overly long and layers are implemented. For example, you don’t want to make their hair overly long and thick to make them look tired and make them feel too hot. Long hair usually allows the Havanese to look more beautiful, yet if you want to make them tilts towards the cute and doll-like side instead, you may want to make their hair very short and fluffy. Just make sure that the haircut isn’t overly short or the entire look would begin to seem unnatural. One nice indicator of how short the hair should be is too make them just barely long enough to show the curves of the hair. That would be able to give them that fluffy and cute look. 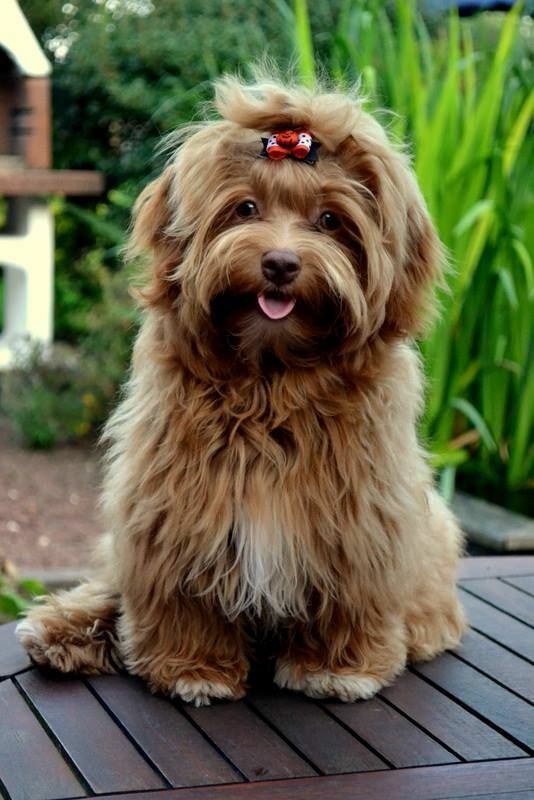 A simple ponytail can make your Havanese look cute and unique. In today’s world, it is a very common thing for both men and women to have a ponytail. In men’s case, it is usually called the man bun. 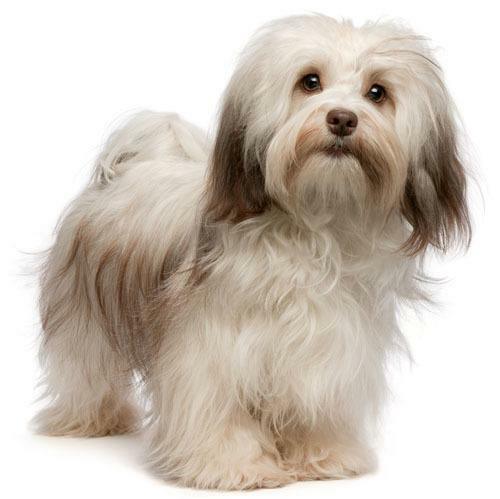 The same concept can be applied to the Havanese, meaning that your Havanese doesn’t necessarily have to be a girl to have a ponytail. It can make your boy Havenese look pretty stylish too. 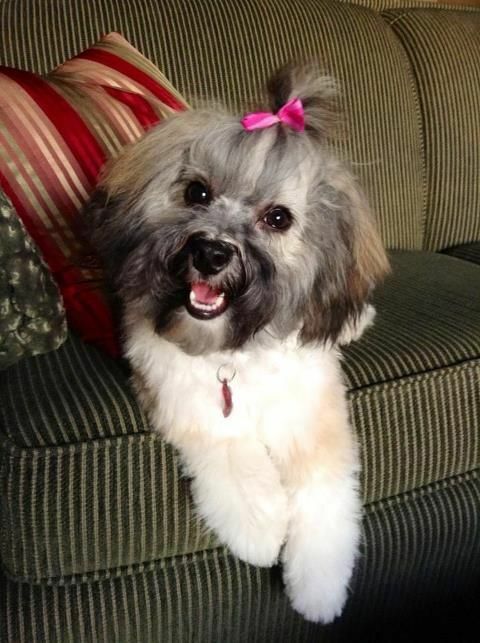 On the other hand, if you are looking for a hairstyle that only works for a girl Havanese, here is one for you. Instead of having the ponytail at the center back of the her head, you may want to make her look even cuter by adding a side ponytail to her hair. Also, you may want to tie the hair with something like a pink or yellow ribbon to make your girl look even more girly and lovely. Alternative, you may want to tie it with a simple elastic band in a sharp color to look eye catching with looking too high profile. 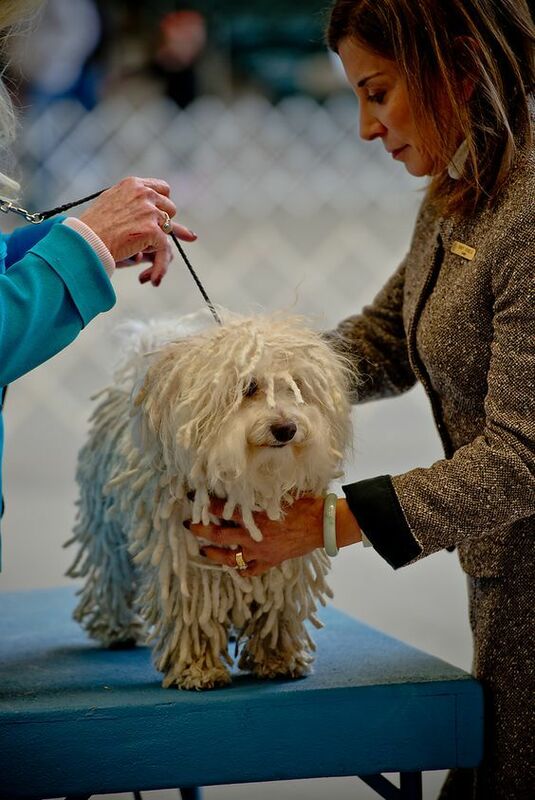 For those of you who are afraid to make your Havanese really stand out from the crowd, the corded hairstyle may be something that you are interested in. 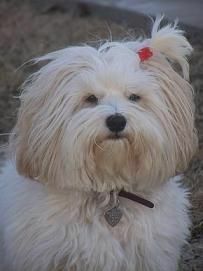 As you can see from the picture, a Havanese with a corded hairstyle can look really stylish. In my opinion, I think it is a little stylish for a dog that is supposed to look cute and small. But hey, if your Havanese has a tough character that matches the corded hairstyle well, I don’t see any reason not to try out this unique and super cool look. In order to make your girl Havanese look even more girly, wearing a braid is very good idea. To look simple and clean, wearing one braid on one side of the head is usually a good way to style. This hairstyle would look weird for boy Havanese, so just don’t try it. You can also get a little more sophisticated and creative by wearing multiple braids. I like to keep things asymmetric to look cute. For example, having one braid on the left side and two braids on the right side can make your Havaness look lovely and stylish at the same time. Sometimes, it is because that we have our Havanese to look special for a specific event so we want to make them dress up by changing their hairstyle. For those of you who want to do that yet don’t have the time to spend, the good news is that a simple hair clip can already make your Havanese look unique and cute. Like shown in the above picture, a nifty black, red and white hair clip can already upgrade the look of him significantly. Again, you can get very creative by wearing multiple hair clips, though usually a single clip yields the best result. You have got to remember that, unlike human, your Havanese’s long hair is spread around the entire body. That means that you can think outside the box and do a cross-body hairstyle. 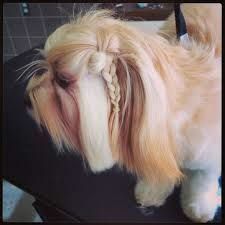 In this case, a long braid that is spanned over the entire body can make the Havanese look very beautiful and unique. 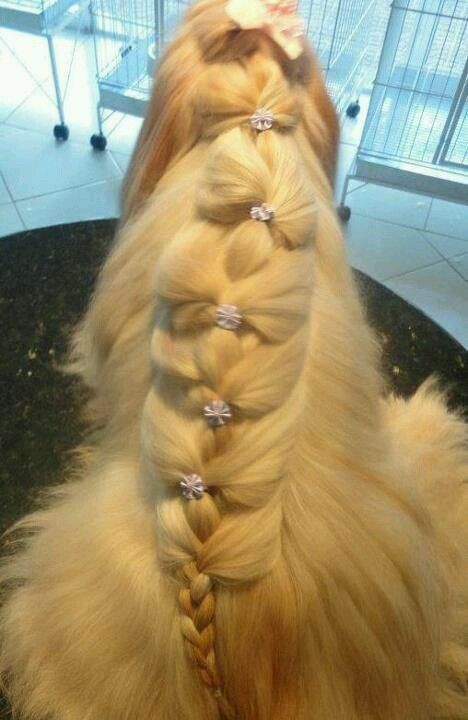 Note that there are some crystal accessories spread across the braid to make your Havanese look even more attractive. One thing to note that doing this kind of braiding can be super time consuming. So if you are in a hurry, just stick to the hair clip or ponytail idea. One of the simplest ways to upgrade your Havanese’s hair style is to wear a large ribbon right at the middle of the top of his head. Although this time may sound very simple, the result is actually very nice. This is an especially handy trick when you want to make your Havanese look good but you are in a hurry. 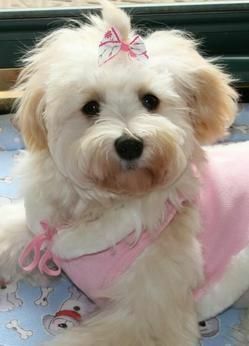 This hairstyle is more suited for girl Havanese. And if you want to make her look eye catching, try a shocking pink big ribbon. I hope you like the above list of Havanese haircut and hairstyle. See if you and your Havanese want to try them and look special.